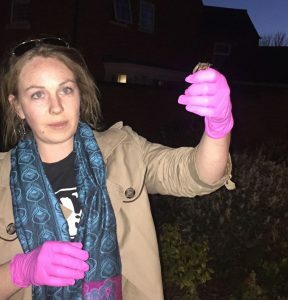 Tonight saw the successful release of a bat (named Bryany), a little soprano pipistrelle, who was found by members of the public. They contacted the Bat Group and one of our members picked her up. After a couple of months in care, and with the good weather over the next few nights, the decision to get her back into the wild was made. Two of our members (Angelena and Amelia) took her and released her back where she was found, and the lady who found her was so happy to see her again. She took a few minutes to warm up, then took off making lots of confident circuits of the area. After a while we watched her enter a roost! A great success! If you find a grounded or injured bat at any time of year, please contact the Bat Conservation Trust (BCT) helpline via http://www.bats.org.uk/pages/help.html or 0345 1300 228. A dedicated national network of volunteers will be able to help. If are specifically interested in helping Nottinghamshire Bat Group with bat rescue or care, then please contact us via this website. If you record any species of bat anywhere in the county, then we’d love to have the record for our ‘Echolocation Location’ project. How many babies do female bats have a year? Usually only one a year, twins are rare in Britain. It is a common misconception that bats breed like mice and have large litters every few weeks. Young bats are large and well developed at birth and can weigh up to a third of its mothers body weight.